EL 4416 is a brown coal exploration licence (EL) covering approximately 3,700 square kilometres of Victoria. In a February 2010 presentation, Ignite Energy Resources stated that it estimates there are approximately 16 billion tonnes of "JORC standard" lignite in the area. EL4416, the company boasted, is a "world scale energy and fertiliser resource." The company states that the total lignite resource within the licence area is 2-300 billion tonnes. However, JORC -- the acronym for the Joint Ore Reserves Committee -- set out standards for the estimation of mineral resources and ore reserves. The JORC standard has been adopted by the Australian and the New Zealand Stock Exchanges. The Department of Primary Industries lists Ignite Energy Resources as the title holder of EL 4416. The licence was previously held by Victoria Coal Resources. (The pink section on the image is EL4416). A report by states that Ignite Energy REsources was formed in November 2008 "as a result of a merger between Ignite Energy Pty Ltd, which owns the intellectual property rights to the Cat-HTR technology (patents outstanding) and Victoria Coal Resources Pty Ltd (“VCR”), a coal and coal bed methane developer. VCR acquired Ignite Energy Pty Ltd for a consideration amounting to A$65 million consisting of a mix of cash and scrip. Upon completion of the merger, the merged group adopted the name Ignite Energy Resources Pty Ltd (i.e. Ignite). Ignite’s key focus is to advance and commercialise the Cat-HTR technology as well as develop the coal bed contained within EL4416." A September 2007 submission by Victoria Coal Resources stated that "the Company’s principal asset is the brown coal rights of EL 4416. 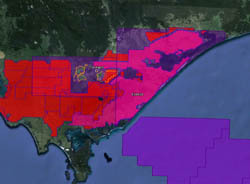 The licence area is located within the Gippsland Basin region of South East Victoria and covers approximately 3,700 square kilometers. The in-situ brown coal quantities are estimated to be in excess of 200 billion tonnes with approximately 14 billion tonnes within the measured and indicated resource categories." A March 2009 article about IER's coal-to liquids dreams with EL 4416, stated that "IER’s long term plans will see the export of liquid and solid products from Ignite Energy. The ports under consideration for this export activity are Barry Point in South Gippsland and the Port of Hastings in Western Port. The Barry Point area has been used for many years as the marine supply base for the offshore Gippsland Basin oilrigs. Currently, the Barry Point terminal can handle ships up to 5,000 tonnes in capacity. IER plans to develop a larger marine terminal around Barry Point to handle much larger ships. As for the deep water Port of Hastings, the Victorian Government is planning significant upgrades to its infrastructure to allow bulk material exports. However, the Victorian Government would need to develop appropriate rail infrastructure to allow transportation of the bulk products from the IER projects from South Gippsland to Hastings. Meanwhile, liquid exports would require pipeline infrastructure." A map with the article showed notional transport infrastructure options as being to export via the port of Geelong, on the far side of Melbourne, or via Barry Point (more commonly known as Port Anthony) or the Port of Hastings. ↑ Ignite Energy Resources, "Transforming low-energy resources into high-value cleaner fuels & fertiliser", Presentation to Gippsland Major Projects Summit, February 10, 2010. ↑ Australasian Joint Ore Reserves Committee (JORC), "Mineral Resources and Ore Reserves", Australasian Joint Ore Reserves Committee website, accessed March 2011. ↑ Department of Primary Industries, "EL4416", GeoVic database, accessed March 2011. ↑ Grant Thornton, "Ignite Energy Resources Pty Limited – Independent Expert’s Report", April 20, 2010, page 22. ↑ "Australia: Victoria’s lignite reserve to drive local port development", Baird Maritime Magazine, March 11, 2009. This page was last edited on 5 February 2013, at 09:18.